A Royal Marine was killed by "friendly fire" during intense fighting in Afghanistan, an inquest has heard. 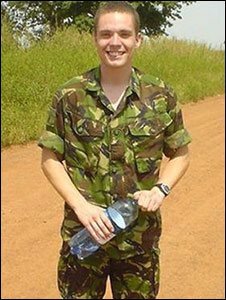 Jonathan Wigley, 21, was fatally wounded on 5 December 2006 during battles with Taleban fighters near Garmsir, Helmand Province. The 21-year-old from Hook in Hampshire was lying in a ditch awaiting orders when he came under fire from an American F18 jet. The inquest at Oxford Coroner's Court is due to last five days. Marine Wigley's company, 45 Commando Royal Marines, was being supported by US fighter jets in a battle to dislodge Taleban forces when he was hit. He and another marine were seriously injured. They were removed from the scene, still coming under fire, and the decision was made to withdraw troops. Pathologist Nicholas Hunt said Marine Wigley had been struck "with a very large amount of energy" - probably by a 20mm non-exploded projectile. Marine Wigley was born in Melton Mowbray, Leicestershire, and grew up in Grantham, Lincolnshire.